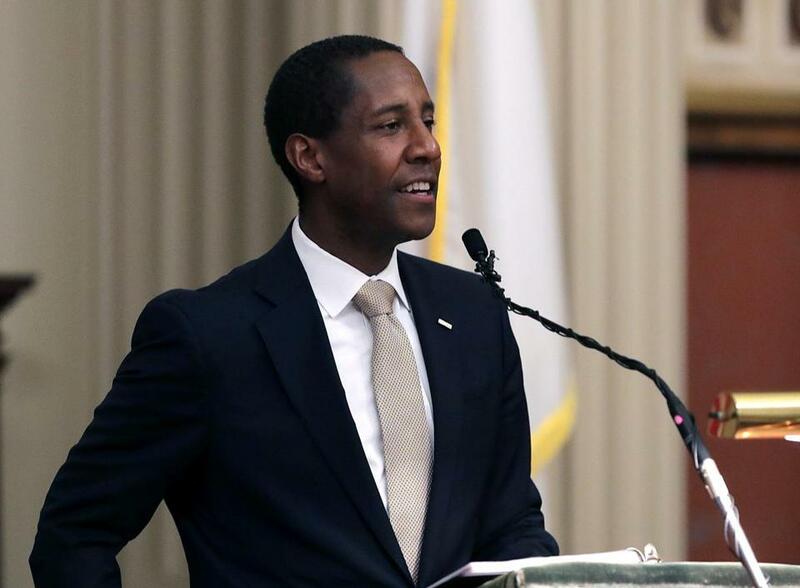 Newton Mayor Setti Warren is a fan of the Washington Place project, but developers must convince the city council. The more things change, the more they stay the same: Please read on for the latest big development battle in Newton, the latest small business closing in Harvard Square, and the latest plea on immigration from the region’s tech executives, as well as other business news for Wednesday, Feb. 22. Newton’s tough balancing act: Here we go again. Another project that could bring affordable housing to a place that badly needs it faces an uncertain future. That the project is in Newton, a city that struggles to add affordable units, only enhances the feeling of déjà vu. I’m talking about Washington Place , a proposal by Robert Korff that would replace a tired block of buildings in Newtonville, at the corner of Washington and Walnut streets. Korff has dialed back his five-story project to 160 units, including 24 affordable and 16 “middle income” apartments, along with street-level retail spaces and a parking garage. But some neighbors say the scale is still too big for the village, and could set a bad precedent for other parts of the city. This site is a stone’s throw from a bus stop and train station, on a busy road, making it as ideal as they come in Newton for a dense development. Thebusiness community wants it, as does the majority of the city council. Mayor Setti Warren is a big fan ; it’s part of his affordable housing strategy. But in Newton, unlike Boston, the city council holds the power over land-use decisions. Because of a challenge from abutters, Korff needs to win over 18 of the 24 councilors for the zone change he wants, and it doesn’t appear he has the votes. Despite Warren’s advocacy, city records show that fewer than 20 affordable units have opened so far in Newton since 2010. (Another 33 are under construction.) Only 7.5 percent of the city’s housing is considered affordable by state officials. The tug-of-war between progress and protection is a tough one, a balancing act that Newton still hasn't seemed to master. Jon Chesto is a Globe reporter. Reach him at jon.chesto@globe.com and follow him on Twitter @jonchesto. Fighting back: The American Civil Liberties Union has teamed up with the left-leaning Alliance for Business Leadership to seek support from Governor Charlie Baker on the immigration front. The two organizations crafted a letter that urges Baker to continue to speak out against President Donald Trump's "Muslim ban," publicly and behind the scenes. And the groups call on Baker to support a new bill known as the Fundamental Freedoms Act that would prevent state agencies from helping the federal government establish a discriminatory "registration" system based on religion or national origin. A number of prominent businesspeople signed the letter, including Vertex Pharmaceuticals founder Joshua Boger, Flybridge Capital Partners general partner Jeff Bussgang, and Jody Rose, head of the New England Venture Capital Association. Power shortage: Brockton Mayor Bill Carpenter says he doubts the natural gas-fired power plant that has been long planned for his city will come to fruition anytime soon. It's a major concession for a mayor who had been public in his support of the controversial project. The Enterprise reports that Carpenter says he doesn't think the plant will go up "in the foreseeable future." The state's energy facilities siting board has continued to grant extensions for the project, but it didn't participate in the most recent energy commitment auction orchestrated by power grid overseer ISO New England. Former developers Advanced Power and Siemens have backed out, although construction magnate Jay Cashman remains involved. Last chapter: The blows keep coming to the Harvard Square we all know and love. The latest to fall: Schoenhof’s Foreign Books, which bills itself as the oldest and largest foreign-language bookstore in the United States; it has been in business for 161 years. Madeleine Flanagan is converting the store to an online-only operation. Unsurprisingly, she blames rising rents, an issue that's affected many mom-and-pop retailers in the square. The Out of Town News and Crimson Corner newsstands face tenuous futures, for example, and Revolution Books closed last year. Delayed opening: It always seemed ambitious of GE executives to think they could renovate two older brick buildings in Fort Point and build a new 12-story office structure by the end of 2018. Now, the Boston Business Journal is reporting that GE is agreeing the project could stretch into 2019 after all. The BBJ cites a recent "cooperation agreement" that states the construction will be completed by June 30, 2019. GE executives have previously said they hoped to open the two older buildings on Necco Court early next year and to move into the new structure by the end of 2018 (emphasis on the word "hope"). A GE spokesman downplayed the importance of the 2019 date in the new document, saying it's " entirely consistent with what we anticipated given the size and complexity of this project." Until then, GE will continue to use temporary space on nearby Farnsworth Street as its headquarters. The chips are up: Advanced Micro Devices is seriously challenging Intel in the market for chips that power desktop computers for the first time in more than a decade, as AMD launches a new generation of processors. Talent hunt: President Trump's immigration crackdown has tech companies understandably worried about how they'll fill their white-collar jobs. Trump's maligning of the H-1B visa program has left many of tech executives on edge as rumors circulate that a pending executive order could shrink the number of available visas in the program, as the Globe reports today. For now, the H-1B visa program includes a highly competitive lottery, in which there's about a one-in-three chance of being selected. Tech executives are worried that the odds could worsen amid Trump's hire-Americans-first push. The proponents of the program say the domestic talent pool simply isn't deep enough to meet their companies' needs. Want a break from business news? Check out the Globe's new Celtics newsletter, Court Sense. Sign up here. This Talking Points newsletter is compiled by Jon Chesto, filling in for George Brennan while he enjoys some well-deserved time off. Follow George on Twitter at @gpb227. If you liked what you've read, please tell your friends to sign up.